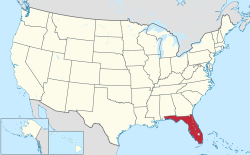 Florida is a state in the southeast United States. It is a peninsula, which means that water surrounds the state on three of four possible sides. To the west is the Gulf of Mexico, to the south is the Florida Straits, and to the east is the Atlantic Ocean. As of 2015, the population of Florida is 20,271,272. The highest elevation in Florida is Britton Hill. For other uses, see Florida (disambiguation). Florida was discovered in 1513 by the Spanish Ponce De Leon, who called this peninsula "Tierra de la Pascua Florida" (Land of the Easter flowered) because discovered on Easter: of course, in the next centuries only the last word remained. Florida is a very flat state. It has no mountains. Northern Florida has hills because it is at the very end of the Appalachian Mountains. The highest hill in Florida is Britton Hill, in northern Walton County near the town of Lakewood, Florida. It is 345 feet (105 m) above sea level. It is the shortest of the highest points in all other states. Florida has a very long coastline, which means lots of beaches. The Gulf Stream ocean current goes through the Atlantic Ocean near the east coast of Florida, so the water there is very warm compared to the Pacific Ocean. The Gulf of Mexico on the west coast of Florida is also very warm because it is small and easily heated by the sun. In the center of southern Florida is a very big lake called Lake Okeechobee. It is the seventh largest freshwater lake in the United States  and the second largest freshwater lake entirely within the lower 48 states. Okeechobee is 730 square miles (1,890 km²), about half the size of the state of Rhode Island, and is very shallow for a lake of its size, with an average depth of only 9 feet (3 m). A lot of south Florida used to be covered by a swamp called the Everglades. When Florida was first being settled, farmers found out the soil there was very good for growing plants. So they could use more of the land to plant, they drained a lot of the water away in 1882. In 1947, the state put in levees and canals to make more room for farming and houses. The Everglades is now about half the size it used to be. Most of what is left is now the Everglades National Park. Lots of animals live there, including alligators and Florida panthers. Recently, Florida has been trying to restore the Everglades. At the southernmost tip of Florida is a chain of islands called the Florida Keys. There are 4500 islands in the Keys. The most famous one is Key West. Bahia Honda beach in south Florida. Snow is very uncommon in Florida, but has fallen in every major Florida city at least once. Snow does fall sometimes in North Florida. Florida is the Sunshine State. The reason for this nickname is its warm temperature. During the summer, temperatures may rise up to as high as 109 degrees Fahrenheit (or 40.5 degrees Celsius). Its average temperature is much warmer than many of the other states, but during winter, temperatures occasionally fall below 32 degrees Fahrenheit. In Florida there are many palm trees. Palm trees grow in places that have a warm climate and a lot of sunshine. Florida has both a rainy season and a dry season. Southern Florida does not have four separate seasons. Florida's sunny climate is very popular with visitors. The summer is great for surfing the waves and enjoying the beaches. The most popular sport in Florida is fishing. A lot of people also like to visit the beaches on the west side of Florida, near Tampa. Florida also gets a lot of hurricanes. Florida is surrounded by warm water, which makes hurricanes get stronger. Hurricane season is from June 1 to November 30, but sometimes a hurricane will hit outside of the season. Hurricane Andrew was a very bad hurricane that hit Florida on August 23, 1992. Florida's most active recorded hurricane seasons were in 2004 and 2005, when it was hit by hurricanes Charley (August 13), Frances (September 4–5), Ivan (September 16), Jeanne (September 25), Katrina (August 25), and Wilma (October 24). Birds: Bald Eagle, Northern Caracara, Snail Kite, Osprey, White and Brown Pelicans, Sea Gulls, Whooping and Sandhill Cranes, Roseate Spoonbill, Florida Scrub Jay (state endemic), and others. One subspecies of Wild Turkey, Meleagris gallopavo, namely subspecies osceola, is found only in the state of Florida. Many species of eastern North American birds go to Florida in the winter. In the 1930s, the Red imported fire ants were accidentally brought from South America to North America. Since then, they have spread to most of the Southern United States, including Florida. They are more aggressive than most native ant species and have a painful sting. A lot of non-native snakes have been released in the wild. In 2010 the state created a hunting season for Burmese, Indian and African rock pythons, green anacondas, and Nile monitor lizards. Launch of the U.S. Space Shuttle Columbia, from Kennedy Space Center in Florida. The capital of Florida is Tallahassee, and Jacksonville is the state's largest city. Tallahassee is in the part of Florida called the panhandle, or the narrow part in the northwest. There are other big cities in Florida, like Tampa, Orlando and Miami. Orlando is home to many amusement and theme parks, like Walt Disney World Resort, Sea World, and Universal Studios. Millions of tourists visit Orlando each year. There is also Busch Gardens in Tampa, which is another tourist attraction. The oldest city in Florida is St. Augustine, which was founded by the Spanish in 1565. The Kennedy Space Center is on Merritt Island, near Cape Canaveral, on Florida's Space Coast. Florida has eleven state universities. They are Florida A&M University, Florida Atlantic University, Florida Gulf Coast University, Florida International University, Florida State University, New College of Florida, University of Central Florida, University of Florida, University of North Florida, University of South Florida, and University of West Florida. The University of Central Florida has the most students. There are 28 private universities in Florida. ↑ "State Motto". 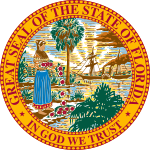 Florida Department of State. Retrieved September 14, 2018. 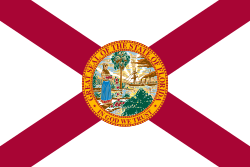 ↑ "Article 2, Section 9, Constitution of the State of Florida". State of Florida. 1988. Retrieved September 14, 2018. ↑ 4.0 4.1 "American FactFinder". United States Census Bureau. Archived from the original on September 11, 2013. Retrieved January 31, 2008. ↑ "Population and Housing Unit Estimates". United States Census Bureau. January 4, 2019. Retrieved January 4, 2019. ↑ "Median Annual Household Income". The Henry J. Kaiser Family Foundation. Retrieved September 13, 2018. ↑ 9.0 9.1 "SB 230 – State Symbols/Fla. Cracker Horse/Loggerhead Turtle [RPCC]". Florida House of Representatives. Retrieved April 7, 2012. ↑ Main, Martin B.; Allen, Ginger M. (July 2007). "The Florida Environment: An Overview". University of Florida, Institute of Food and Agricultural Sciences. Archived from the original on 2010-11-20. Retrieved 2008-01-23. ↑ "SOFIA Virtual Tour - Lake Okeechobee". archive.usgs.gov. ↑ U.S. Geological Survey (1999). "Florida Everglades". Circular 1182. U.S. Geological Survey. Retrieved 2008-03-14. ↑ Stewart, Melissa (2003). Life in a Wetland. Twenty-First Century Books. p. 11. ISBN 978-0-8225-4687-0. ↑ "Not all alien invaders are from outer space". United States Department of Agriculture. Archived from the original on 2010-11-20. Retrieved 2007-12-03. ↑ "State creates season for hunting pythons". Melbourne, Florida: Florida Today. 23 February 2010. pp. 6B. Archived from the original on 24 February 2010.